Joe hits the nail on the head with that statement. 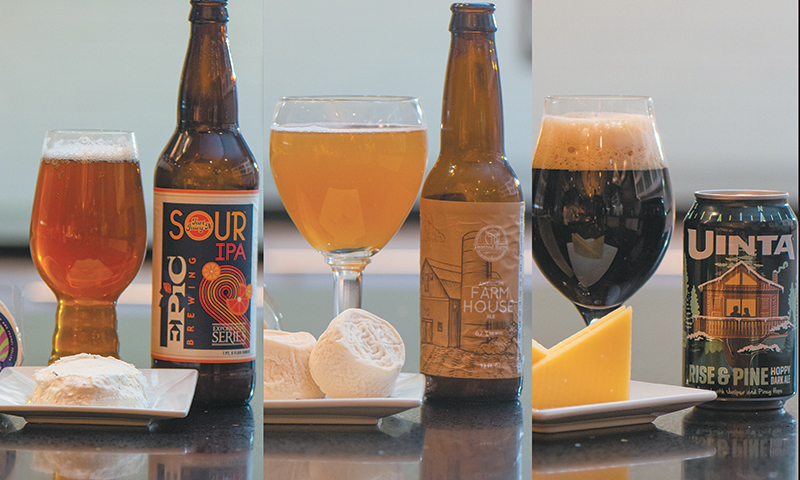 Pairing cheese and beer is becoming more regular in the industry, and rightfully so. Both cheese and beer share many similar flavor properties, thanks in part to them both having shared base componentry. Beer has main elements like malt, hops, yeast, adjuncts such as fruit/vegetables/bacteria/lactose (aka: milk sugar!). Cheese is similar—the animals eat grain/vegetation, cheeses can be aged with adjuncts both externally and internally, and cheese develops similar flavors during the ripening process: nuttiness, caramel/browned butter notes, fatty, sweet, bitter, sour, umami. With so much in common, it only makes sense to have them together. Each of the cheeses featured are available through Utah’s own Harmons Neighborhood Grocer, and their team of cheesemongers and Certified Cheese Professionals love to help you find the right cheese for the right beverage. This pairing is a meeting in the middle. Both beer and cheese have distinct and bold flavors, yet they complement and give each other more finesse. Rise & Pine has a fairly high IBU, and the addition of juniper heightens the “resiny” aromatics. However, it’s the maltiness that locks in the pairing with the cheese. Kaltbach Gruyere is aged for a minimum of 12 months. It has defined nuttiness and browned-butter tones, along with some beefy/fruity notes and a touch of sharpness. Those browned-butter tones complement the malts in the beer and produce a pleasant cream tone, while the fattiness of the cheese helps subdue those hoppy/resiny notes in the beer and turn them into an almost sweet flavor. 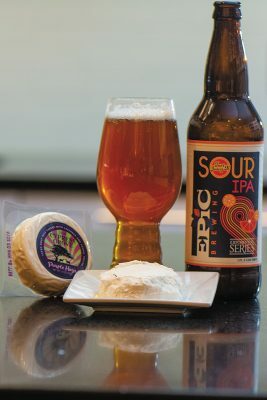 All in all, this is a great pairing for a brisk evening with friends who are fans of big beers and full-flavored cheeses. This is a somewhat more aggressive pairing, in that there are Belgian yeasts in the beer, and the cheese is made from goat’s milk with a yeast rind—a potential for A LOT of flavor. This beer exhibits herbal and fruity notes while having a crisp, almost cider-like finish. A fun fact about this beer is that all but the hops are sourced from within the state of Utah! 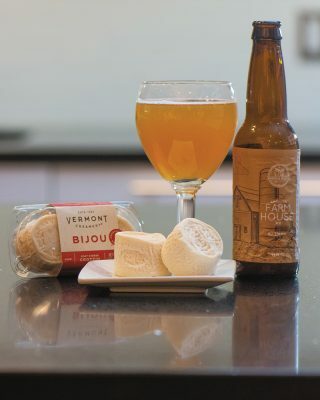 “Married to this beer is a Bijou” (French for “jewel”) from Vermont Creamery, which is a soft, ripened-goat’s-milk cheese that has a geotrichum yeast rind. Mention this yeast to almost any seasoned cheesemonger, and you’ll certainly get an involuntary smile—we love this stuff! Characterized by a wrinkly exterior, this cheese is soft and luxurious with a mild acidity, tart fruitiness and a sweet-cream finish. The two play off of each other and bring out the fruity/herbal aromatics in the beer while enhancing the sweet cream of the cheese. Finish that off with a crisp, acidic finish and a clean palate thanks to the effervescence of the beer. This has to be one of my favorite pairings of all time. It’s bright, fun and has the most delightful finish. Epic’s sour IPA is upfront with lots of citrus and sour notes, almost like a Sour Patch Kid with the “red” flavor. It’s funky but not full-on Parliament, and it’s hoppy but not so bitter that it inverts your face. It’s crisp, relatively clean for a sour and has that under-ripened, red-fruit flavor in the finish. Partnering it up with a fresh chevre is a no-brainer, but partnering it with a fresh chevre that has fennel pollen and lavender might sound a bit strange—it’s not! The beer tames the fennel pollen into a lightly sweet aroma that almost has a touch of a cinnamon character, while the full fat of the goat milk tames the sour aspect of the beer. Fat can be both a vehicle for flavor or can be used as a diffuser of strong flavors. The finish is the real kicker, though, as the sweet goat’s milk and citrus hops couple up to produce a lemon-chiffon note that shows up late and then lingers on the palate. 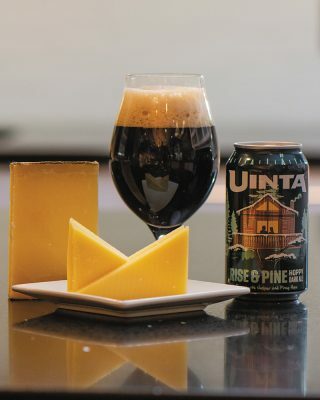 Editor’s Note: The print version of this article incorrectly swapped the photos containing Epic and Uinta products with their corresponding cheese pairings. This has been fixed in this online version.